Every Nativity evokes an emotion from the viewer. This Nativity became an instant favorite because it makes me laugh each time I see it. 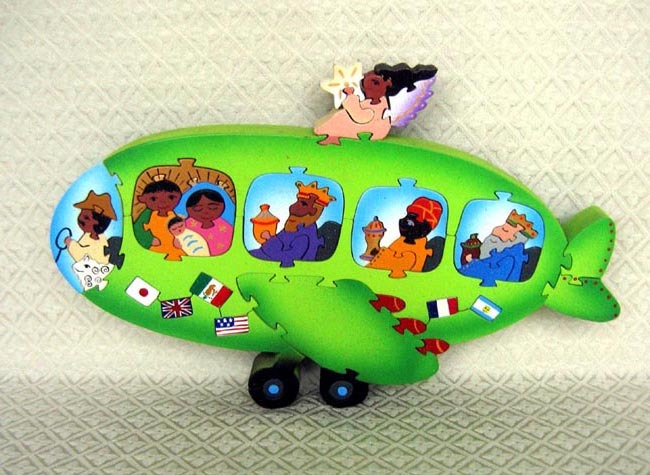 The Holy Family, angel, and three wise men travel in comfort in an airplane! Even the lamb happily joins the pilot in the cockpit. Flags from several countries decorate the bottom of the airplane. We appreciate the flags' symbolism that the influence of Jesus is known throughout the world. The scene is meticulously cut from a single block of wood into interlocking pieces and then hand-painted by artisans in Queretaro, Mexico. From this painstaking process, all of the decorations become separate pieces (even the country flags) and the entire scene is also painted on the opposite side of the airplane. The airplane measures 15 inches wide by 9 inches tall to the top of the angel. This artisan group has been in business for 20 years. They have many painted-wood designs, but they only started making Nativity scenes in 2009. This is the first time they have had the opportunity to sell their Nativities in USA. The family that created the business works with about 70 workers who all contribe to the final product (design, cut, sand, paint etc.). The family employs many disadvantaged workers: some of the workers who sand the wood have no legs, one painter is deaf, and one artisan is burned. They also employ single mothers from the town of Tequisquiapan.